In August 2013, the Centers for Disease Control issued a press release about Lyme disease. They had made a mistake. The agency reported that their previous estimate of 30,000 annual Lyme disease cases in the U.S. was actually closer to 300,000. The discrepancy between estimated and actual cases calls into the question the credibility of Lyme disease diagnostics. Falsely positive test results, hiding spirochetes and symptoms that often imitate other diseases have made it difficult for doctors to successfully diagnose and treat Lyme disease. “There are practicing doctors who think Lyme diagnoses are way overblown. Other medical doctors find Lyme disease everywhere,” said Dr. Richard Ostfeld, the author of Lyme Disease: The Ecology of a Complex System, in an interview in March 2014. One reason Lyme disease is difficult to diagnose is that early symptoms, such as fatigue, fever, and muscle and joint pain, are nonspecific and can easily be indicative of a different health problem with similar symptoms. “Erythema migrans,” the distinctive “bull’s eye” skin rash associated with Lyme disease, usually appears within seven days of a tick bite, but is not present on all patients affected by Lyme, according to the American College of Physicians. Another major problem is the lack of reliable tests for Lyme. The American College of Physicians reported that blood tests “cannot diagnose Lyme disease alone, but…are used to confirm a diagnosis” because the most common test, the ELISA, does not actually test for Borrelia burgdorferi, the spirally twisted bacterium that causes Lyme disease, but instead tests the body for Borrelia burgdorferi antibodies, which may take up to two to six weeks to appear in the blood after the bite of an infected tick. Other bacterial infections and diseases can cause an ELISA test to be positive when a person does not have Lyme disease, the American College of Physicians reported. Blood tests do not test for the bacteria directly simply because they are unable to. “After the initial transfer of the bacteria from the Ixodes tick into the person, the spirochetes spread locally, but after an initial bacteremic phase, the organisms can no longer be reliably found in body fluids,” the U.S. National Library of Medicine reported. 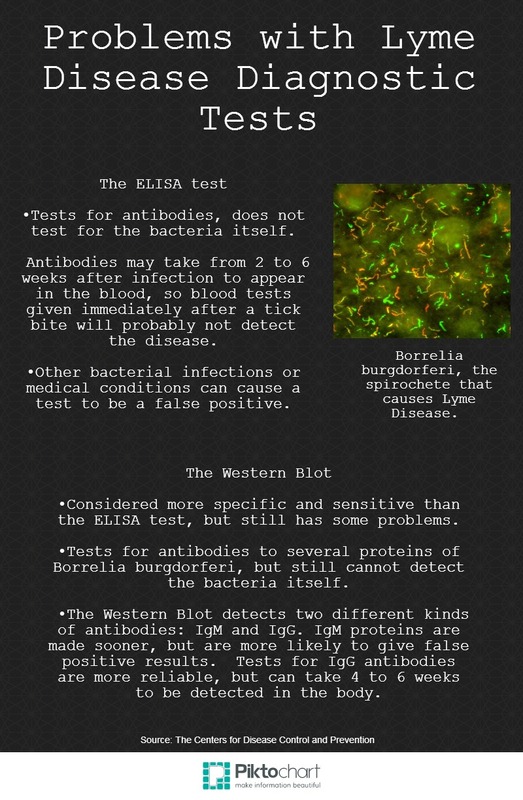 A follow-up blood test, the Western blot, is often required for a Lyme disease diagnosis and is considered more accurate because it detects antibodies to several proteins of Borrelia burgdorferi, but still cannot detect the bacteria itself. With no way to confirm the presence of Borrelia burgdorferi in the body, doctors are left to speculate whether or not a person actually has Lyme disease based on symptoms, personal history, and possible exposure to ticks. In the meantime, Borrelia burgdorferi can spread to the brain, heart, and joints within weeks to months after a person is bitten by a tick and infected, leading to stage two of Lyme disease, when numbness or pain in the nerve area, paralysis or weakness in muscles of the face, and heart problems can occur, according to the New York Times’ Health Guide. If Lyme disease goes undetected for months or even years after a person is bitten by an infected tick, or antibiotic treatment fails to eliminate all of the bacteria, it advances into late disseminated Lyme disease. This third and final stage of Lyme disease, often associated with chronic Lyme disease, can cause long-term joint inflammation, heart rhythym problems, and complications in the brain and nervous system, according to the American College of Physicians. Symptoms of late stage Lyme disease, like those of early stage Lyme disease are nonspecific but more severe. Tests might also fail to detect Lyme disease once it has advanced to a later stage due to Borrelia burgdorferi antibodies no longer being present in the body. Dr. Joseph Breen, the Program Officer for the Lyme Disease Research Program in the National Institutions of Allergy and Infectious Diseases at the National Institute of Health, said that the medical community has begun research in order to improve Lyme Disease diagnostics, in a web conference in September 2012. “Current diagnostics are less than optimal for early disease because it can take weeks for a detectable immune response to be sufficiently measured. The early stages of diseases when treatment is typically most effective unfortunately are when serum diagnostics are least effective,” Dr. Breen said. Research on Lyme disease diagnostics is diverse, and includes studying host response to infection, metabolic biomarkers and biosignatures, and other scientific mechanisms to aid in the direct detection of Borrelia burgdorferi. Dr. Breen said the researchers were asked to avoid “traditional serological approaches,” which focus on detecting antibodies. “We’re…trying to encourage people to do different ways of measuring Borrelia burgdorferi,” Dr. Breen said. The projects selected in 2011 began in September 2012. Dr. Breen said researchers were asked to complete their projects within two years. One project leader, Linda Bockenstedt of Yale University, is working on “developing a new diagnostic cytokine assay for LD [Lyme Disease] based on a novel panel of Bb [Borrelia burgdorferi] antigens expressed in the skin and/or required for Bb [Borrelia burgdorferi] infection and persistence in the mammalian host,” according to a National Institute of Health report. These two projects are among nine listed by the National Institute of Health as ongoing research projects focused on improving Lyme disease diagnostics. While the National Institute of Health expects results from research projects later this year, others in the medical community see the search for better diagnostics as a long-term process. Heather Carolan, a Principal Scientist at Ibis Biosciences Inc., a California-based company that uses molecular technology to identify infectious agents, said that while they some research on Lyme is being conducted, Lyme disease is “on the backburner,” due to other priorities decided by the management, such as broad viral assays. Carolan said that Ibis has screened thousands of ticks in the U.S. and Europe in order to develop a molecular diagnostic test that would directly detect for Borrelia burgdorferi, while others in the medical community are mostly doing antibody research. “It’s a slow process, but it’s definitely needed,” Carolan said. With companies such as Ibis Biosciences Inc. and the National Institutes of Health working to improve Lyme disease diagnostics, there is hope that some of their findings will produce tests that allow doctors to reliably diagnose patients with Lyme disease based on bacterial evidence, instead of diagnosing based on self-reported symptoms, history, and antibody tests. In order for Lyme disease diagnostics to improve, researchers must gain intimate knowledge of the cause of the disease, the tricky and dangerous spirochete, Borrelia burgdorferi. “The better we understand the disease, better we understand Borrelia burgdorferi and the better we understand a response of the host to Borrelia burgdorferi then we should be able to better design diagnostics, better treatments and potentially prevent the disease using vaccine,” Dr. Breen said. The National Institute of Health’s research projects on Lyme disease diagnostics will conclude in late 2014. Any improved diagnostics that may result from the research will determine if the Centers for Disease Control’s new numbers match the reality of the situation.